What exactly are these sash/ribbon things? Sashes are part of the insignia that accompanies membership in an order of chivalry or merit. Most countries, even ones that don't have a monarchy, have some sort of honors to bestow. Each order has its own specific rules regarding who can award it, what it can be awarded for, and who can receive it. Each order has its own story as well. Founded in 1348 by King Edward III, Britain's Most Noble Order of the Garter is one of the most famous orders still in use. Legend has it that the garter of a lady the King was dancing with slipped to the floor, prompting the King to pick it up and tie it on his own leg. To those that snickered, he proclaimed: "Honi soit qui mal y pense", or "shame upon him who thinks evil upon it", which became the order's motto. It has been in continuous use since then. Prince William is the 1000th Knight of the Garter; he was inducted in 2008. The ribbon used for the sashes is unique to the order, and it is the easiest way to tell orders apart. Below, we have a selection of royal ladies wearing some of the sashes we most commonly see. All of these orders come from the same country these women are representing. Some countries only have one order to give out, and others have multiple orders that are ranked by precedence. Most of these are the highest orders available to royals from these countries; Sophie and Letizia are the exceptions. Mary is a Knight of the Order of the Elephant. The collar is used at the most formal occasions, including the annual New Years gathering. When the collar is worn, the sash from the same order is omitted. Victoria on her 18th birthday. When do you get them? Policies for awarding orders vary from country to country. Sometimes it's automatic, when a royal comes of age or when a new member marries into the family. (Example: Crown Princess Victoria received the insignia of the Order of the Seraphim when she turned 18, and her husband received the order immediately after they were married.) In other countries, orders are very hard to come by. The United Kingdom is one such country: Queen Elizabeth rarely gives out orders. The highest order in Britain is that famous Order of the Garter, and it is also the most exclusive. While the Prince of Wales is automatically a member, the Queen's three youngest children were in their 40s before they were inducted. She never awarded the Garter to her sister, Princess Margaret, and she's never given it to anyone that married into the family. The late Princess of Wales and the Duchess of York were never given British orders (the royal family order is a different story); the Countess of Wessex received her first sash in 2010 when she was given the Royal Victorian Order (a lesser order) after ten years of marriage and several years of solid service to the Queen. She also has the Order of Saint John - again, lower in significance. Men wear orders with white tie in the evening and with military uniforms, as prescribed by the military guidelines for the specific uniform they happen to be wearing (for example, some uniforms may require only the star). Women wear orders when the men are in white tie, meaning they are in gowns and tiaras (usually); they would also wear them if and when they wear military uniforms, with the same guidelines. That said, there are many exceptions to the rules. Formal day dress with uniforms or morning coats for the men (orders are worn with uniforms, but not with morning coats) and long dresses, hats, and orders on display for the ladies used to be a common occurrence; now, Prinsjesdag in the Netherlands is one of the only examples remaining. Ladies may not be required to wear their orders in the evening, depending on the event. And sometimes, it's just all kinds of confusing, such as at the ball following the royal wedding in Monaco. Some ladies wore sashes, some wore only stars, some wore no insignia at all. Chaos, I say. How do you wear them? Once you have your orders, you're all set to go...but wait! You can't just throw things on. Oh no, you have to wear all this stuff in a very specific manner, and finicky people on the internet will catch you if you do it wrong. For starters, you must wear your sash in a certain direction across your body. Most are worn from the right shoulder to the left hip, but there are exceptions. You will note above that the Order of the Seraphim and the Order of the Elephant have nearly identical light blue sashes; the most obvious difference is that they are worn in different directions. You'll also need to make sure that you have your stars placed just so, and that nothing is going to fall off. For royal ladies, all those brooches will take care of that. Fun fact: a brooch is often used on the back as well - a bit of unseen bling. Crown Princess Mary (far left) often uses a brooch with a small diamond "F" on her back. Aww. Which order should you wear? For an event in your own country, at which no other countries are involved (we'll get to that in part 2), you'll generally want to wear the highest order you have from your country. If you have multiple orders from your country, you can wear some extra ornamentation. Remember how I said orders are ranked by precedence? 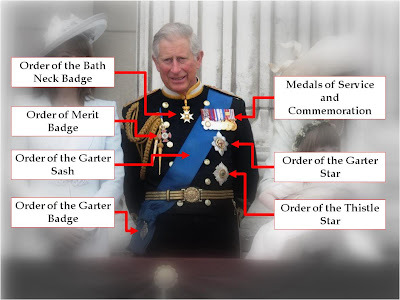 The order of highest rank gets the prime insignia spots: the Order of the Garter is his most important order, so he wears the sash, badge (fun fact: a Garter badge is called a Lesser George), and the star in the highest position on his uniform. 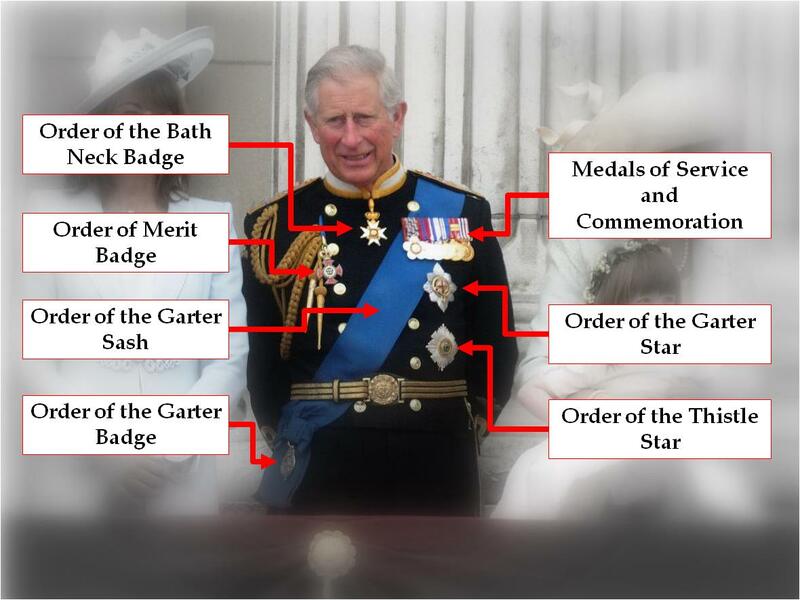 Moving down in precedence, Scotland's Order of the Thistle gets the second star place, and then the Order of the Bath takes the neck badge spot. His other decorations (the badge from the military Order of Merit, and various medals of commemoration) assume their regular uniform locations. So, now you know: it's not as random as it looks, and everything has a meaning. Are you still with me? Is anybody still out there? I told you this was a picky thing. And this is just royals and their decorations from their own country. It gets worse when it becomes an international party. So stay tuned for Sashes, Part 2: When Countries Collide.